He blindsided viewers on Monday night when he took prospective love Hannah Brown home a week early to meet his parents - before dumping her mid-date. 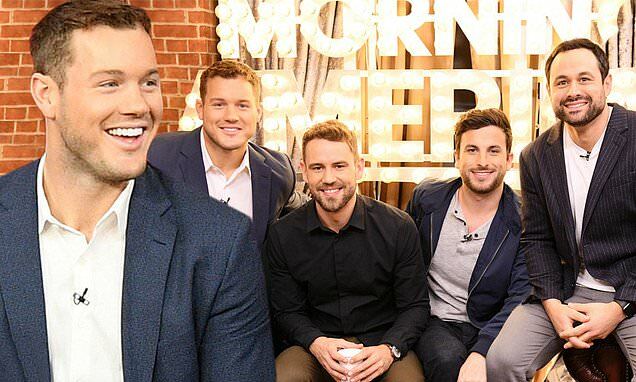 And opening up about his unceremonious decision and the upcoming episodes of The Bachelor, Colton Underwood appeared on Good Morning America on Tuesday. The 27-year-old hunk kept things casual for the appearance while continuing to keep mum on the upcoming episodes. Colton dressed in a form-fitting button-up white shirt and a pair of navy trousers. He sported little to no facial hair and combed his light tresses back off of his face. The love-seeking star wasn't alone, with fellow ex Bachelor personalities's Nick Viall, Tanner Tolbert and Jason Mesnick. The boys shared their experiences on home dates and all revealed that week of taping was the hardest. The Former NFL star's appearance comes after Monday night's episode saw him take one of the women home to meet his parents early - to dump her hours later. Surprising his parents with Hannah Brown's appearance, the star privately confessed to his dad Scott that his feelings for the Miss Alabama beauty queen weren't as strong as with some of the other women.